Teak Wood Sandstone is a fantastic choice for those wanting something totally unique and something that will be hard to find anywhere else. Its unique almost wood like veining is simply elegant and beautiful and no two slabs are ever the same giving you a completely bespoke patio every time. Teak, more popularly known as Khatu Teak is fine grained, creamish in color. The brown veins through out the surface reflects a wooden finish and hence named as teakwood sandstone. 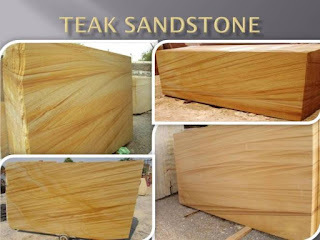 The teak sandstone is available only in tiles form in sawn surface finish. This teak sandstone can not be polished not it is naturally splittable. Teakwood Sawn Indian Sandstone is one of our distinct ranges of external paving, and can make a real statement with its bold and flamboyant coloring. It cannot be polished nor can be split. It is smoothly sawn on all six sides to give a totally crisp and clean feel whilst still being firm and non slip underfoot. Teakwood Sawn Sandstone attracts attention of almost everyone due to its texture resembling the texture of wood. It is also a great choice for use around swimming pools for its advantages of non slip surface besides being smooth on the surface and help greatly against poolside slips. http://bhandarimarbleworld.com/showroom/ , Typs of Marbles http://bhandarimarbleworld.com/types-of-marbles/ & Check Out Our World class products Gallery. http://bhandarimarbleworld.com/ebook-catalog/ .